Only 5 days to go on the Fireside Magazine Issue 3 Kickstarter, and we still have more than $4,000 left to raise. If you’ve been thinking about throwing in a donation, now’s a really great time to do it! Help support great art, fiction, and fair pay to contributors! Issue Three will include short stories by Daniel Abraham, Elizabeth Bear, and Mary Robinette Kowal, as well as one by Lucas J.W. Johnson… We’ll have a comic written by Rachel Deering and drawn by Christine Larsen. And our artist for the issue is Lisa Grabenstetter. And if you contribute anything, you get a copy of your very own! Pretty damn exciting, yes? I’m ridiculously thrilled to announce my involvement in Fireside Magazine issue 3! For those who haven’t heard of it yet, it’s a robust multi-genre literary magazine that focuses on good good storytelling and great treatment of its creative elements. Issue three will contain fiction by Mary Robinette Kowal, Daniel Abraham, Elizabeth Bear, and Lucas J.W. Johnson. And I get to illustrate all that! Plus the amazing (I am not kidding) Christine Larsen is illustrating a comic by Rachel Deering for the issue, which should be absolutely gorgeous. But yeah, I get to contribute four illustrations (including the cover). Can I reiterate how thrilled I am? If you need to catch up on the back issues, you can do that either by heading over to Weightless Books or by throwing at least $9 to the kickstarter (you know which one I’d recommend…) I’ve read them both, and give a hearty reader’s endorsement. My last post was, admittedly, a little all over the place. I was trying to give a pretty wide sample of the sort of literary magazines out there, regardless of their exact placement on the spectrum that is the speculative fiction genre. So for this post, I’m going to reign it in and talk about a few places you can go to get your fix of Weird Horror (and maybe send that Weird story you just yanked from Weird Tales‘ submission queue). 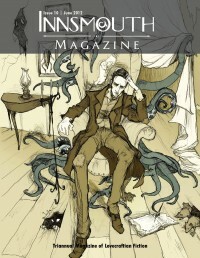 The first is publisher Innsmouth Free Press, and their triannual Innsmouth Magazine. Innsmouth is helmed by the inestimable Silvia Moreno-Garcia*. In addition to being one of the most active review and essay blogs in the genre (think Tor.com but almost exclusively for Weird Horror), it’s also a strong contender for ‘heir to the Weird fiction magazine throne’. A nontrivial cherry on top of that creepy-crawly sundae is their announcement today of a funding drive for their next two anthologies (Sword and Mythos and Jazz Age Cthulhu), with their final push goal being a hike to pro rates for Innsmouth Magazine itself! Secondly, I’d like to highlight Dagan Books, the tiny press responsible for Cthulhurotica. Its focus is similar to Crossed Genres in that its publications tend to take a base made of Weird and mix it with a big ol’ dab of Something Else (whether that be Alien archeology or Books within books.) 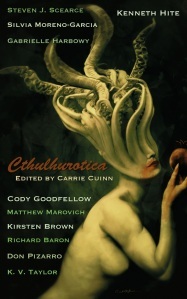 At the moment they’re just about to close submissions for Cthulhurotica 2, so if you have something kicking about your hard drive that might suit, be sure to get it to them before August 30th. Then there’s Chiaroscuro, which is another small Weird horror press with an occasional zine habit. They publish a little bit of short fiction on their website, but have shifted their main focus in a more bookish direction. ‘Embrace the Odd’ is their well-observed motto. If you’re a longtime connoisseur of Weird, you might recognize a number of their authors. And if you’re a devotee of the audible, my two favorite podcasts with a consistent Weird emphasis are the unpredictable (and for me, local!) Drabblecast and the the (very Cthulhic, seemingly never safe-for-work) Pseudopod! I know there are a number of great new anthologies out recently that fit under the Weird umbrella, including one from Ann Vandermeer (the editor of Weird Tales‘ best run) and her husband (author and editor) Jeff Vandermeer**. I’m not going to get into individual novels or anthologies further than that, but if there’s something that I’ve missed or that you just really want to talk about, please do bring it up in the comments! And now for something totally… better. Several very wise people advised me, in the comments on yesterday’s post, to give up and move on. And… after much thought I agree. There is really nothing Marvin Kaye (et al.) can say to me at this point that will restore my faith in Kaye’s capabilities as an editor, or my hopes for Weird Tales’ future as a publication. It had a long, often rocky, often problematic history capped by a few years of shining brilliance… followed by a dive off of a sheer cliff into the sea. RIP, Weird Tales. I’m sorry you had to go this way. But, as Silvia Moreno-Garcia reminded me, all is not lost! There is a veritable smorgasbord of delicious, socially conscious speculative fiction in the world right now. So as a unicorn chaser, let’s talk about some! You might’ve heard about how Mary Robinette Kowal, author and former art director for Weird Tales, stepped up to the plate earlier this week and is using her own pocket money to bump Shimmer up to pro rates for fiction. Shimmer’s known for poignant, thoughtful speculative fiction (that means spanning all genres traditionally thought of as SFF) and general progressive wonderfulness. Fireside Magazine‘s one of the new kids in town. Its focus is on story-driven specfic with compelling, unsinkable plots. Some of my favorite people on the internet are involved in this one, but even detaching myself from that I have to say it’s one of my favorite magazines already. They’re only on issue 2 so far, which makes catching up easy. Crossed Genres has an interesting premise. Every issue takes specfic and crosses it with a different, specific theme – “Lies” and “Bildungsroman” are two examples (full disclosure: yes I have done art for them! I choose well). Also a newly pro-rate market, CG makes a particular effort to showcase marginalized groups and sub-groups in their magazine and anthologies. The ones responsible for ‘Science in my Fiction‘. Apex Magazine is another one I know some folks at: and they’re all cool. A magazine of fantasy and horror, Apex is a venue that puts focus on marginalized and non-USian voices. Famously, their extremely adult reaction to a certain prominent SF author’s outspoken Islamophobia was to publish an issue dedicated entirely to Muslim writers and artists. I’ve been subscribed for some time, and have never been disappointed. Lady Churchill’s Rosebud Wristlet a collaboration between Kelly Link and Gavin Grant of Small Beer Press. LCRW is strange, amusing, and difficult to categorize – each issue contains everything from specfic to recipes, essays to comics and poetry. Of all of the zines listed here, it has the most zinelike feel to it. It’s even printed on a xerox machine and stapled together like something you’d expect to find in the ‘unclaimed copies’ bin at Office Depot. Consistently one of my favorite magazines out there. Also the only one I know of that offers a subscription plan that includes a chocolate bar with each issue. If you need some fiction right now, Lightspeed Magazine has got you covered. An amalgamation of fantasy and SF (they recently absorbed Fantasy magazine) Lightspeed hosts a generous portion of its content for free reading on the web. Delia Sherman, Ken Liu, and Linda Nagata are some recent contributors – to give you an idea of their standard of quality. You can also subscribe and toss these awesome folks a few bucks to keep it going. Clarkesworld is another long-standing and much-loved magazine, with wonderful free content trickling through the website at all times. It’s won more awards than you can shake a book at (the Hugo, Nebula, and Shirley Jackson just to name a few) and even posts audio versions of their stories as an extra bonus. The Future Fire is another favorite of mine (which.. full disclosure, I’ve made art for) Their entire mission statement is to focus on socially progressive specfic. They’re currently collecting stories for a colonialism-themed anthology of new fiction focusing on the experiences of the colonized called ‘We See a Different Frontier’. Definitely give them a read! And if you’re a part-time e-reader like myself, it’s always worthwhile to check out the subscriptions section of Weightless books*. Small Beer press, who owns them, is a great source of exciting and reliably conscientious things. Browse around the whole site and see what some other small presses are up to while you’re there. And if there’s any publication of particular splendor that I’ve missed and you’d like to share in the comments (your own, even) please do! Let’s get the word out: beautiful things do still exist. UPDATE: Oh! And don’t miss this newer endeavor by Ann Vandermeer and friends, the ones who contributed directly to Weird Tales’ former glory. Weird Fiction Review isn’t a literary zine per se, but it’s still a whole lot of strange, neat things all together in one place, curated by people that can be trusted.